Try saying that ten times really fast. As ludicrous as that sounds, that’s what we’ve been trying to achieve with the implementation of the orientation module. We’re subscribing all users to one module that teaches you the basic information you need to know to find your way around. There are several benefits to introducing things this way. We can connect with home based learners.You don’t have to have a face to face induction to be able to use Learning Space, you can learn this stuff wherever you are. We’re using the system to teach the system. As useful as it is to have a Knowledge Base with help information and our 1-2-1 sessions and consultation with staff, a great way to get to grips with the Learning Space is by doing it yourself in your own time, which leads to the next point. It’s always available anytime you want. A key benefit of any Virtual Learning Environment is the ability to setup courses that allow you to learn at your own pace in your own time. We’ve set up the course as you would see any module you subscribe to, with the course links and example information laid out in the same way. The course shows you different ways in which you will see information presented and also how this might be utilised. It also shows you where to find information on other University services, something that is key for those familiar with the old Learning Space of yesteryear. Finally, it introduces us and shows you how to get in contact with us. The orientation is a living course and is continually updated by the team. We’ve had some fantastic feedback from staff and students so far, the more we know about how people use Learning Space the more we can improve, so many thanks for those of you that have taken the time to speak to us. 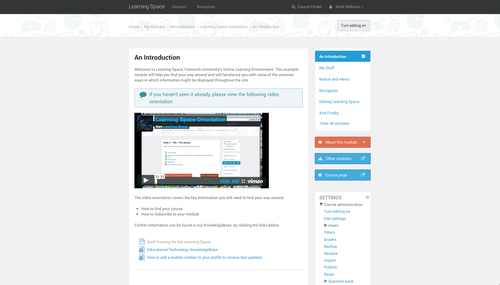 Let us know how you get on Learning Learning Space!